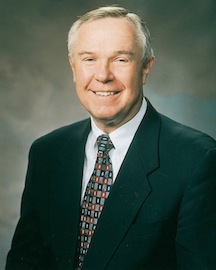 Dennis B. Neuenschwander was sustained as a General Authority of The Church of Jesus Christ of Latter-day Saints on April 6, 1991. He served in the Second Quorum of the Seventy until October 1, 1994, when he was sustained as a member of the First Quorum of the Seventy until he was granted emeritus status on October 3, 2009. He also served in the Presidency of the Seventy from August 15, 2000 until April 3, 2004. He was born on October 6, 1939, in Salt Lake City, Utah. He grew up in Salt Lake and Ogden. He earned his associate degree from Weber State University and his bachelor’s and master’s degrees from Brigham Young University. He earned his PhD in eastern European languages from Syracuse University. He served in the Air Force Reserves and was called up to active duty in the Cuban Missile Crisis. Before being called as a General Authority, Neuenschwander taught Russian language classes at BYU and the University of Utah. He later worked for the Church’s genealogical department and translated and microfilmed genealogical records from eastern Europe. He was served as president of the Austria Vienna East Mission, which included Poland, Czechoslovakia, Hungary, Yugoslavia, Greece, Egypt, Turkey, and Cyprus. He accepted the request of the First Presidency to stay an extra year to expand missionary work into Bulgaria, Romania, and parts of the former USSR. He has also served as a Sunday School teacher and high councilor and served a full-time mission in Finland. Neuenschwander and his wife, LeAnn, had four sons. After her passing in 2007, he married Joni Kay Lee. This page was last edited on 24 May 2016, at 21:48.